When the Disneyland Resort reached capacity I joined in to help out our reporting staff by collecting interesting tweets about the crowded park. The reporting was fun to do, showed the value of reporting via social networks and brought our audience’s content into our report. During the holiday time I found that several readers were sharing photos of a double rainbow to our shareoc inbox and on Twitter and Flickr. 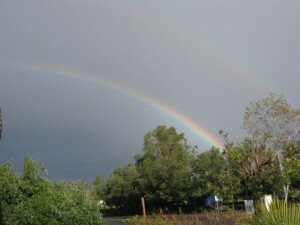 Our science reporter was out for the holiday, so I filled in and posted reader photos and comments about the double rainbow, along with links to previous rainbow stories. Two interesting notes. One, once we started a slide show of rainbow photos other readers were quick to submit their own photos. Two, the readers’ whose photos were used are now frequently sending in breaking news tips and interesting photos. I worked with the Register’s key web and mobile designer, Rick Ho, to create unified branding across the Register’s social media accounts. The first step is the Register’s Facebook pages. I worked closely with the marketing and advertising departments, OCRegister social media users and our social audiences to use the same branding base for our mobile products and social accounts. I led the design, development and roll-out of a new alerts tool. The tool is built in the newsroom’s online content management system and it lets users send a breaking news alert to audiences on Twitter, on Facebook, via text message and (ultimately) via push notification. Before this tool was created, editors would use multiple websites and processes to send an alert – such as that a wildfire had broken out in the forest. The tool auto populates with the best information (pulled from the story and headline) in the best format for each medium. A central bit.ly account lets the Register measure how many people click on each attached link. The new tool’s faster workflow implications also lets us created more niche text message streams for our audiences.